Elegant base frame with ergonomics design. OEM new design are welcome. Accurately fashioned basket, the mesh is so narrow that even very small articles cannot fall through. The handle with plastic sheathing can be provided with advertisem-ents upon request and is screwed to the basket on the handle caps. Golden peaks using permanent gloss finish technology which effectively protect surfaces for years. We supply high-gloss galvanized-chromised coatings with transparent powder coating. We using innoxious safe recycle plastic raw-material, it is our society responsibility. With the usage of UV resistance with revolutionary breakthrough our product do not afraid sunshine any longer, our surface of product, handle logo always keep gloss for years. 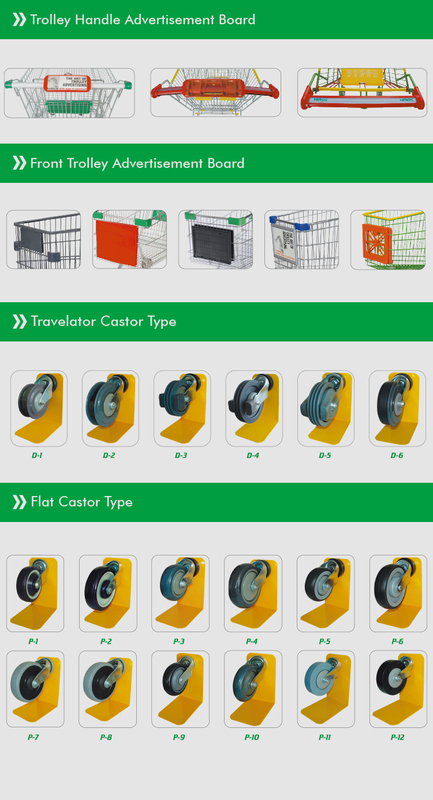 As the constant companion of your customer, shopping trolleys tran-sport goods equally as effectively as your messages. With this fea-ture we design some advertising plate for our customers, . Make use of them for advertising! Any colour plastic parts can be made by the PANTONE and RAL standard card which offered by customers. 1. We supplier high quality products with reasonable price. 8. We supplier one-step solution service. Highbright Enterprise Limited was founded in year 2004 and located in Jiangsu, China. 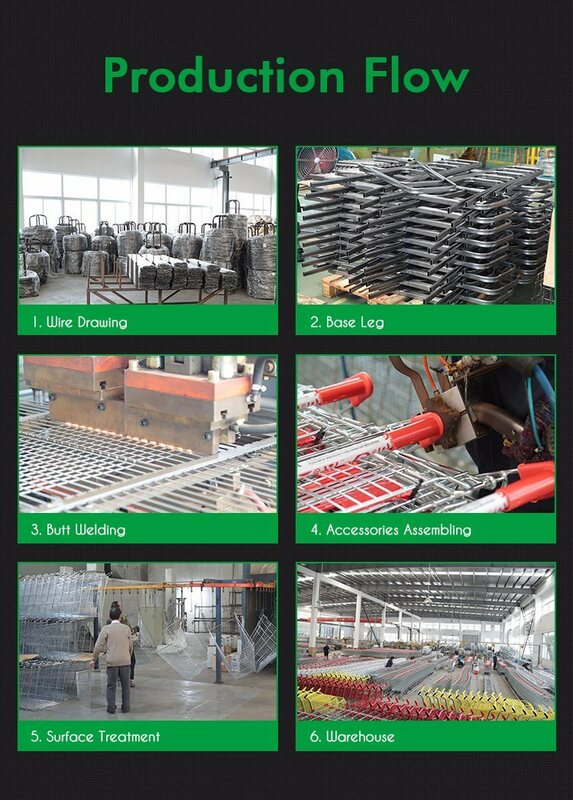 Mainly design and manufacture retail equipments. 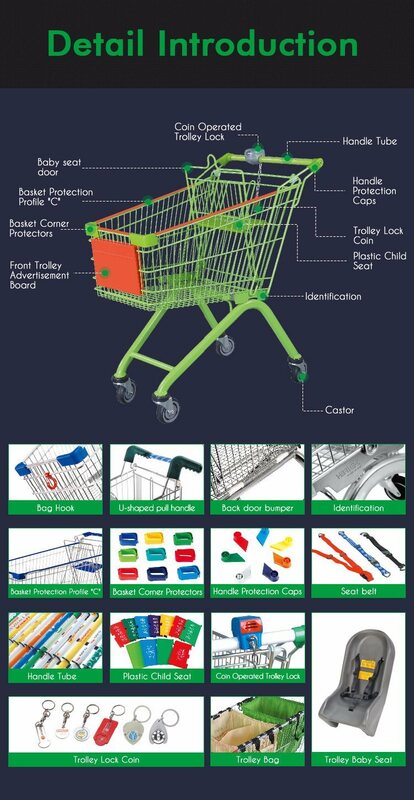 Products include various shopping trolleys, shopping baskets, warehouse trolleys, kids trolley, foldable shopping carts, checkout counters, store fixtures, shop fittings, display shelves etc. With production capacity of ten containers per week, we have cooperated with big chain supermarkets and retailers in Europe, North America, South America, Australia etc. 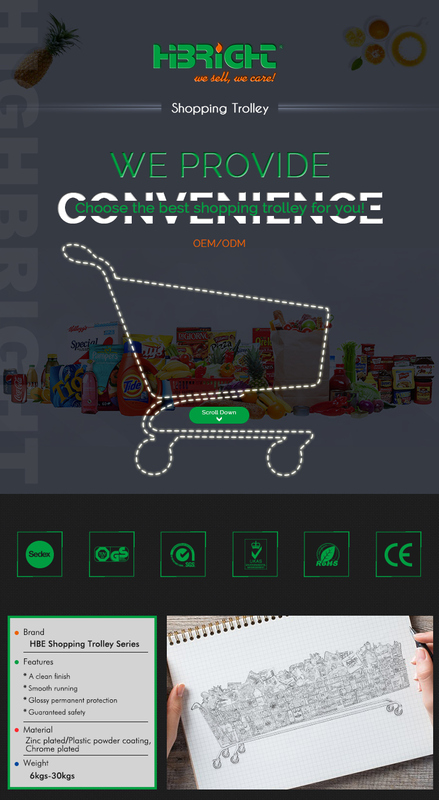 When dealing in these various products fields, HIGHBRIGHT not only offer existing styles, but also customize special and unique design with our professional technique team. With us as your partner, you'll be well prepared to cope with any future changes. That's because we've never reacted to trends,but instead we've actively helped to mould them with our numerous developments.